Taking into account the importance and urgency of the development of Central Asia as a coherent whole region, the from the first days of the presidency focused his attention on the implementation of proactive regional policies, the creation of a favorable political atmosphere in Central Asia, the building of constructive and mutually beneficial relations with the countries of the region in all directions, including transport ― the main priority of Uzbekistan's foreign policy. In our country special attention is paid to the further development of transport infrastructure and the increase in the volume of transit cargo transportation. Currently, our Government is implementing the Program for development and modernization of engineering communications and road infrastructure for 2015-2019, which provides for the elaboration of a single complex development strategy for the national transport industry, which meets high international standards, and ensures its broad integration into international transport communications, taking into account the long-term needs of domestic manufacturers in promoting their products to the regional and world markets. It should be taken into account that today in the country all the necessary conditions have been created for the further development of the transport and transit potential. The country is making efforts to increase the capacity of the transport system, remove existing barriers to unimpeded transit through the territory of Uzbekistan, which plays great importance for the development of international transport corridors in Central Asia. In order to implement key issues of regional development, in November 2017 Samarkand hosted the international conference, "Central Asia: One past and common future, cooperation for sustainable development and mutual prosperity." Addressing the conference, President Shavkat Mirziyoyev spoke about the latest trends in the development of regional cooperation in all relevant areas and initiated a number of proposals on Central Asia. One of the key initiatives of the Head of Uzbekistan ― the adoption of the U.N. resolution on Central Asia has triggered international support for its implementation and in June this year the U.N. General Assembly adopted the resolution on "Strengthening regional and international cooperation for ensuring peace, stability and sustainable development in the Central Asian region." The resolution envisages the development of sustainable, best-value infrastructure supporting transport and transit corridors and the strengthening of links between all modes of transport, including by opening new roads and railways, as well as flight routes, as well as the implementation of transport and transit agreements encompassing Central Asia. These are the shortest routes in the region, which connect the major international markets. The transport and transit potential of the region is determined by its geostrategic position ― in the center of the "Great Silk Road," historically serving as a bridge between East and West, North and South. According to some reports, the length of the railway communication system of Central Asian countries extends more than 22,000 km. Kazakhstan has the largest and most exploited railway, which accounts for 66 percent of the total length of the region's railways and accounts for 84 percent of all freight transport. About 18 percent of regional railways pass through Uzbekistan, accounting for about 11 percent of all traffic. Turkmenistan has about 12 percent of regional railways and 4 percent of all traffic. Recently, under the conditions of a confident and friendly atmosphere in Central Asia, it is becoming possible to take practical measures to implement real transport projects. The activity of the International Intermodal Logistics Center "Navoi" is intensively developing, which connects Uzbekistan with major logistics centers of foreign countries, in particular, Frankfurt, Milan, Brussels, Vienna, Zaragoza, Oslo, Basel, Dubai, Delhi, Tehran, Shanghai. In 2016, the Angren-Pap railway line was put into operation. This road, being an important link in the railway corridor "China-Central Asia-Europe," will provide China's access to the countries of Central and South Asia in the shortest possible way and will contribute to the development of the economy of Uzbekistan. In February 2017, the air connection between Tashkent and Dushanbe resumed after a 25-year hiatus. In September 2017, the Dustlik checkpoint on the Uzbek-Kyrgyz border was resumed, which is a landmark event in the history of the Uzbek and Kyrgyz peoples. This event will give impetus for the development of multilateral cooperation between the two countries. In 2017 new railway and automobile bridges were opened _ the Turkmenabat-Farab across the Amudarya River, which made it possible to increase the volume of cargo transportation by 2.5 times. Bridges across the Amudarya open a direct access of freight traffic from the states of Asian-Pacific region, South Asia to the Caspian Sea and further to the Black Sea and Mediterranean regions, the countries of Europe, the Caucasus, and the Middle East. In addition, bridges are important links of the transport corridor Uzbekistan-Turkmenistan-Iran-Oman. The work on the construction of the Uzbekistan-Kyrgyzstan-China railway has been intensified. This transport project is relevant in the SCO space, as China, Kyrgyzstan and Uzbekistan are members of this organization, moreover due to this transport project, trade and economic relations will grow and expand not only between the project participants, but also between all the countries of Central Asia with China. The railway will provide the opportunity to transport goods from China through Kyrgyzstan and Uzbekistan to Eastern Europe and the Middle East, thereby becoming one of the shortest routes for transporting of Chinese goods to Europe and also will allow the transport-logistical infrastructure of the Central Asian countries to develop. In February this year the Tashkent-Andijan-Osh-Irkeshtam-Kashgar automobile corridor was opened, which allowed road haulers from Central Asia to directly enter China for the first time. In March this year, the Jartepa checkpoint on the border of Uzbekistan and Tajikistan was opened, connecting Samarkand with Penjikent. the activity of eight automobile and one railway checkpoint "Amuzang" has been restored. 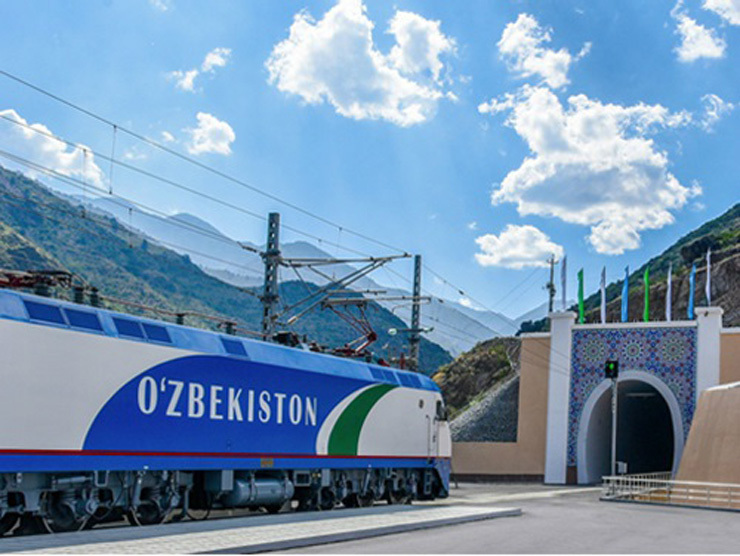 The commissioning of the restored section of the Uzbek-Tajik interstate railway line Galaba-Amuzang-Khushadi will play an important role in the development of transit traffic and will create conditions for the opening of additional opportunities for access to Turkmenistan and Afghanistan. The strategic future and prospects of Central Asia are directly related to the involvement and active participation in regional processes of Afghanistan, as this country is an integral part of the region. During the visit of President of Afghanistan A. Gani in 2017 to Uzbekistan, the parties signed agreements on the implementation of the Surkhan-Puli Khumri transmission line. The new line will undoubtedly increase the supply of electricity from Uzbekistan to Afghanistan by 70 percent ― up to 6 billion kWh per year. Uzbekistan has made a great contribution to the development of Afghanistan. In 2011, the first railway in Afghanistan, the "Hayraton-Mazari-Sharif," was built. In the long term, the sides will implement a project for the construction of the Mazari-Sharif-Herat railway line, which will make a significant contribution to the economic reconstruction of Afghanistan. The railway line will definitely increase the trade turnover and transit potential of Uzbekistan and our country will have a direct access to Iranian ports, including Bander Abbas and Chabahar. In 2017, an air communication between two countries was established. This step will contribute to the formation of Tashkent Airport as an air hub, which will be used by passengers of the Afghan airline for connecting flights to Germany, the United Kingdom and other European countries. The development of cooperation with Afghanistan in the field of transport and construction of new railways within the "Trans-Afghan" corridor in the future will provide Central Asia with the shortest access to the ports of the Indian Ocean and the Persian Gulf, and will connect South and South-East Asia with the markets of Europe and China. The countries of our region have recently intensified their efforts to increase their transport capabilities of international importance. 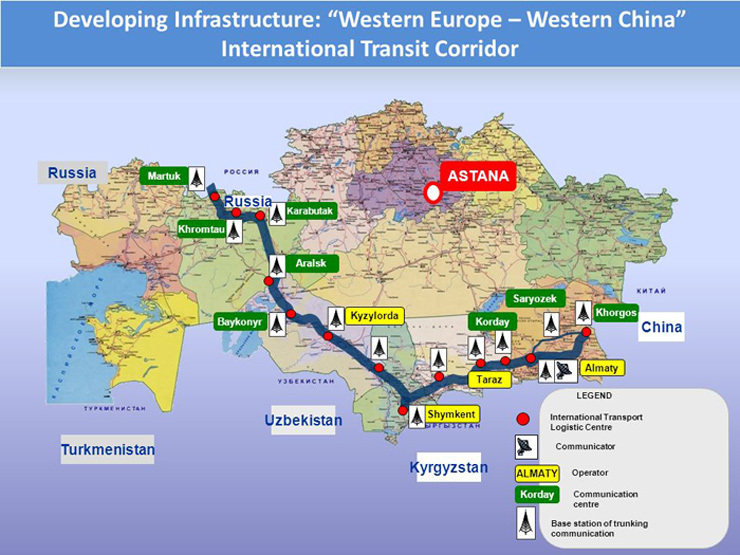 Today, a number of international transport projects are being laid across Central Asia. Among them is "Eurasia" transport corridor. This corridor is planned to be built and launched during 2018-2023, which will connect China and Western Europe. The highway will pass from Beijing via Astana, Moscow and Minsk to Berlin. According to some forecasts, by 2050, 20 million tons of cargo and 37 million passengers will be transported through the highway annually. The China-Kazakhstan section began operating in 2016, which will become the shortest route to Europe with a transportation period of from 10 to 12 days. Full-scale launch of the project is not expected until 2030. The corridor will run along the route St. Petersburg- Moscow-Orenburg-Aktobe-Almaty-Khorgos. In 2017 representatives of Afghanistan, Turkmenistan, Azerbaijan, Georgia and Turkey signed an agreement on the creation of the transport corridor "Lapis lazuli." It is supposed that railway and automobile routes will connect the city of Torgundi (Afghanistan) with Ashgabat, the port of Turkmenbashi on the Caspian Sea. The corridor will further pass through the Caspian Sea to Baku, then through Tbilisi to Ankara with branches to Poti and Batumi, further from Ankara to Istanbul, Kars in Turkey with further access to the transport system of Europe. In May 2018 a container train traveled along the route China-Kazakhstan-Turkmenistan-Iran. The total travel time along the railway route was about 2 weeks, which is on average twice as fast than by sea. It is believed that by 2022 the volume of cargo transportation by rail will be 15 million tons per year. The project is designed to provide transport links between China and Europe. The key link in the East-West transport corridor is the Baku-Tbilisi-Kars railway line. This project will play a key role in establishing regular shipments of goods from Turkey and Europe to the countries of Central Asia and China, as well as to Iran. Uzbekistan is interested in participating in this project. According to the decree of the President of Uzbekistan "On measures to improve the transport infrastructure and diversify foreign trade routes for carriage of goods for the period from 2018 to 2022," measures are being taken to implement pilot transit of foreign trade goods via the Baku-Tbilisi-Akhalkalaki-Kars railway line with access to ports. According to some information, the opening of the transport corridor is planned for 2020. This transport corridor will connect the port of St. Petersburg with the Iranian ports of Bender-Abbas and Chakhbahar, acros which the sea branch reaches to the Indian port of Mumbai. Importance for Central Asia is that the transport corridor will simplify the transport of goods from Central Asia, passing through Iran to the countries of the Persian Gulf. The corridor will be able to provide transit of 3-5 million tons of cargo annually. This transport corridor is of great importance for Uzbekistan. During the SCO summit in Qingdao in June 2018 President of Uzbekistan Shavkat Mirziyoyev said that Uzbekistan supports the construction of the railway lines Mazare Sharif - Herat, China - Kyrgyzstan ― Uzbekistan, and the development of the trans-regional corridors Central Asia-Persian Gulf, North-South and East-West. In conclusion, I would like to note, that on September 20-21, 2018, Tashkent hosted an international conference on "Central Asia in the system of international transport corridors: strategic prospects and unrealized opportunities." During the event participants discussed such issues as transport and transit potential of Central Asian countries, new corridors in the region, creation of network of customs warehouses, training of specialists for the sphere, creation of modern conditions and development of customs and border procedures for international freight transport, introduction of information technologies, marketing and digital transport services, regulation of railway tariffs. - jointly develop transport communications and infrastructure in order to increase the tourist attractiveness of the region. This would be facilitated by the development in cooperation with the World Tourism Organization of the Concept for the development of tourist hubs in Central Asia.